Teala Dunn, who is known best for her role on the TBS show "Are We There Yet? ", is now making an appearance on the hit Disney Channel show "Shake It Up!" 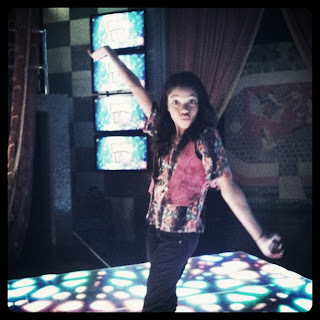 Teala talked to me about her experience on the set, "I had so much fun on the set! Everyday I had lunch with Bella Thorne and Zendaya Coleman!" The actress had fun while the cameras were off too, "We watched funny youtube videos on our down time! I had met Zendaya and Bella at a teen choice party a while back but it was great to catch up. I had a lot of fun with Adam Irigoyen as well, and we had to do school together so got to know each other." What does she think of her upcoming episode? "I can't wait for everyone to see my episode! It's so funny and fun!" Be sure to catch Teala on "Shake It Up!" Airing soon on Disney Channel! Teala Dunn is also on a exclusive show, The Naked Brothers Band. I watch a least 2 episodes everyday!!!! I love NBB!!!!!!!!!! I was so surprised to see "Jaunita" (NBB role name) on Shake It Up! !